First, huge congrats go to Zap Guitar, winner of the Israel Mobile Summit startup contest! They definitely have the cool factor and we're sure we'll hear of them a lot. Thanks also to all other finalists - you guys rock! The summit this year has become the prime event for the mobile apps ecosystem in Israel with over 600 attendees from all over the industry. We also had guests and speakers from the US, UK, France, Finland, Romania, Japan, India and more. We also got prime-time coverage in the main news cast of the leading Israeli TV channel - see the Israel Mobile Summit coverage on channel 2 news here. We had the pleasure of hosting Jari Tammisto, the President of MobileMonday who came all the way from Finland, you can see his inspiring session here. In fact you can watch all of the summit sessions in the Israel Mobile Summit YouTube channel - you can catch there sessions from VSERV, BlackBerry, Nokia, Jajah, PayPal, uTest and panels with speakers from Amdocs, AT&T, Startapp and more. To get notifications about our future events, register to the MoMoTLV Meetup group. 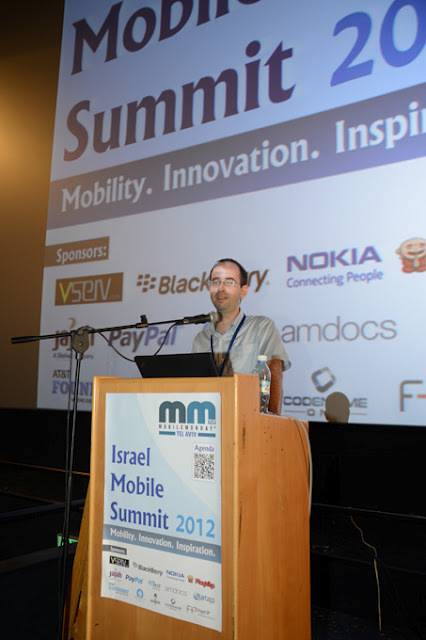 See you at Israel Mobile Summit 2013!